When you are searching for a specific type of heavy duty stub end thimble for the job you have in mind, we reckon you’ll find it quickly and easily with us. Whilst you’re looking around, why not browse our lifting shackles, wire rope pullers and other types of thimbles. RSD offers a cost-effective range of heavy duty stub end thimble which are ideal for use on yachts, sailing boats, garden projects, art and landscaping too. It is particularly excellent for use in marine and industrial rigging and uses involving wire rope. These thimbles are designed to add a more stable end loop whilst protecting the wires. They create a quick, easy and stable anchor point on the wire rope allowing it to be easily attached to other fittings and connectors. Manufactured from top quality stainless steel, they’re great for deployment in adverse weather and salty marine environments, as they will not become rusty and unreliable. 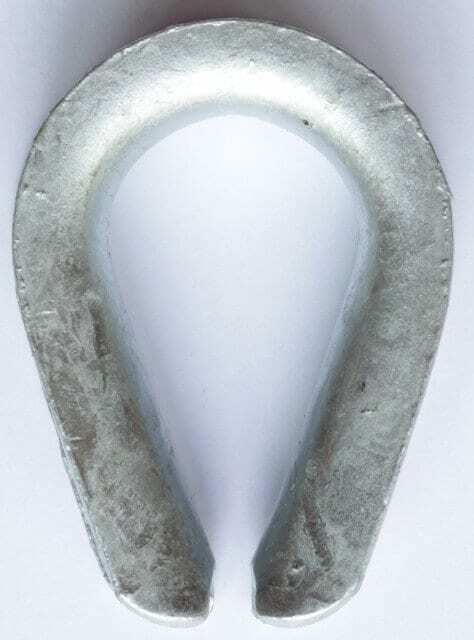 We have these thimbles available in a range of sizes to suit wire rope diameters from 8 mm up to 50 mm. Please refer to the table below for more details. At Rope Services Direct we are pleased to be able to supply heavy duty stub-end thimbles in a huge range of finishes and sizes. You simply need to fill in our quick and easy form here to tell us what you require so we can help. Don’t forget, if you can’t see what you need, we are likely to be able to make a bespoke item for you or source it elsewhere. Needing to speak to us or ask a question? Make contact with RSD today. Call 01384 78004. Heavy Duty Stub End Thimble Overall rating: 5 out of 5 based on 6 reviews.